Mary Martin Chepiga is a Supervisory hydrologist with the U.S. Geological Survey, where she has worked since 1979. 2003-present Chief Hydrologic Simulation Program, responsible for technical and fiscal integrity of projects involving the simulation of ground-water flow, solute-transport, and ground-water/surface-water interactions. Supervises and provides technical support for numerical modeling projects. recent and current projects include: 1) a water-budget analysis of ground-water flow in the confined Coastal Plain Aquifers of NJ as part of the NJDEP Water Supply Master Plan, 2) a MODFLOW and MODPATH analysis of ground-water flow and conservative particle movement in the lower confined aquifers of Salem-Gloucester Counties, 3) A GWM optimization analysis of available withdrawals within the Critical Areas of NJ, 4) a MODFLOW and MODPATH analysis of ground-water flow and conservative particle movement in the unconfined and upper confined aquifers of the Great Egg/Mullica basins and 5) a MODFLOW and MODPATH analysis of ground-water flow and conservative particle movement in the unconfined and upper confined aquifers of the Ocean County Area. Continuing work on Delaware River Basin SPARROW nutrient modeling study as a co-principal investigator to provide additional analysis, model calibration and documentation. 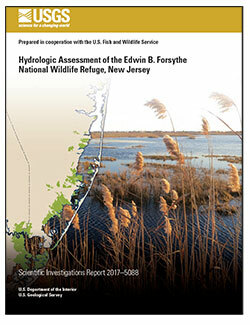 2002-2004 Project chief, Delaware River Basin SPARROW nutrient modeling study. Developed and analyzed spatially-referenced regression model of total phosphorous and total nitrogen loads in DRB streams. 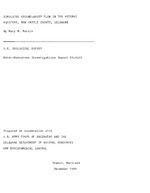 1986-1994 Toxic Substances Program, Picatinny Arsenal Project. Developed, calibrated, and documented multispecies transport model used to evaluate fate and movement of chlorinated solvents in ground-water. Developed model code for reactive multispecies transport in two-dimensional ground-water flow systems. 1988-1991 Ground-water modeling specialist. Technical advisor on ground-water modeling studies and provided technical support to project staff on hydrologic analysis, model development, programming, and model calibration. 1985-1986 USGS Graduate Training Program, attended Rutgers University, departments of Biochemical Engineering and Computer Science. 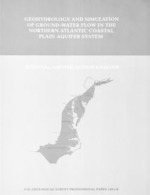 1982-1985 Northern Atlantic Coastal Plain RASA ground-water flow modeling study. Calibrated and documented multi-layer ground-water flow model of 10 aquifers in NC, VA, MD, DE, NJ and NY for the national Regional Aquifer Study Analysis project. Model defined prepumping and 1980 flow conditions. 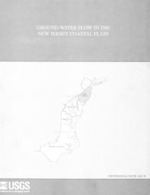 1982-1985 Project chief, New Jersey RASA ground-water flow modeling study. Developed, calibrated, and documented multi-layer ground-water flow model of the NJ Coastal Plain aquifers for the national Regional Aquifer Study Analysis project. Model defined prepumping and 1978 flow conditions in 10 aquifers. Geohydrology and simulation of ground-water flow in the Northern Atlantic Coastal Plain aquifer system; 1993; PP; 1404-K; Leahy, P. P.; Martin, Mary. 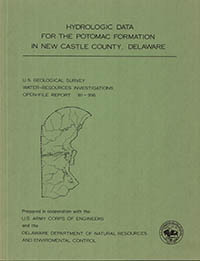 Martin, Mary M.; Denver, Judith M.
Hydrologic data for the Potomac Formation in New Castle County, Delaware; 1982; OFR; 81-916; Martin, Mary M.; Denver, J. M.
Lovell, H.L., Parizek, R.R., Forsberg, Donald, Martin, Mary, Richardson, Deborah, and Thompson, Jean, 1978, Environmental control survey of selected Pennsylvania strip mining sites: Final report to Argonne National Laboratories: The Pennsylvania State University, University Park, Pennsylvania, 668 p.